Do you love to craft but don’t want a huge stash of supplies to organize and store? Do you love to craft but don’t always want to come up with the ideas? Do you love to craft on the go? Do you love having exclusive products? 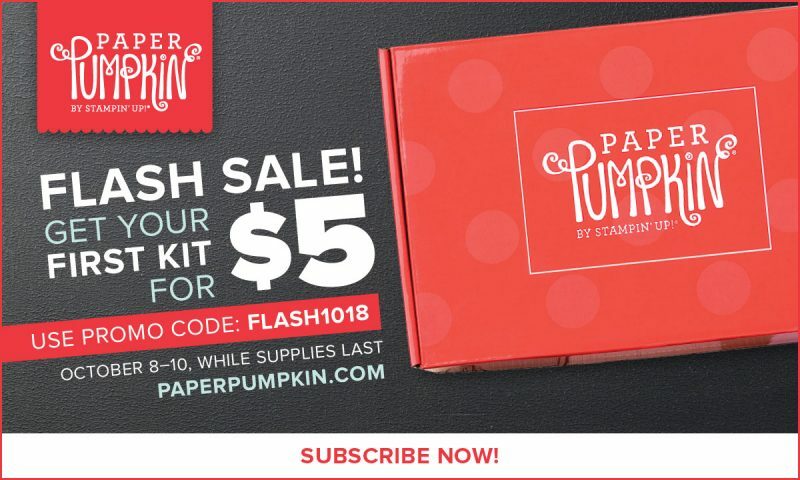 If you said yes to any of these our Paper Pumpkin Monthly Craft kit is for you and during this sale, you can try out a FULL size kit for just $5. Ability to control subscription yourself – cancel, skip a month, add an extra kit. The flash sale begins October 8 at 12:01 AM (MT). The sale runs while supplies last or until October 10 at 11:59 PM. If our supply runs out before October 10, we’ll end the sale and automatically begin accepting new subscribers for November (which will be our one-of-a-kind, exclusive holiday kit in a specially-designed box). No obligation to continue after this month BUT you may want to consider sticking around for Novembers exclusive HOLIDAY KIT!!! Consider it done! Hope you don’t miss the sale!